When you get a new puppy, it is your responsibility to see to it that your new fur baby is well-loved and is cared for. No matter whether you are busy running household chores or are occupied with outdoor errands, you have to make use of best puppy toys to keep them busy. If you want to see your puppy healthy and happy, then you must provide it with engaging and interactive playtime. This fun and enjoyment with puppy toys will keep your puppy stimulated for a long time while you finish your other errands. One of the most popular selections of toys for dogs of all ages is Kong Classic. Being durable and interactive, it is one of the most popular options when it comes to puppy toys. It keeps your puppy stimulated for a long time period which means that the puppy won’t get bored even if the owner isn’t home. 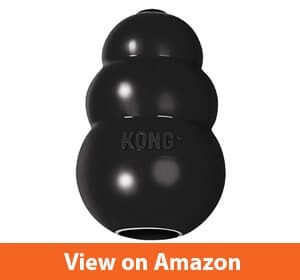 The good thing about Kong Classic is that it aids your dog in a lot of aspects. 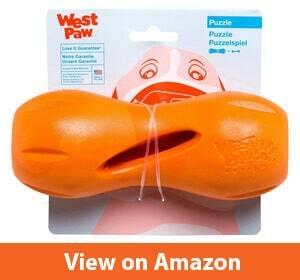 This toy is excellent for mental stimulation and being a chewable treat, it offers relief for teething puppies. When your puppy plays with it on the floor, the toy bounces all over the floor and hence keeps your pup chasing it for a long time. 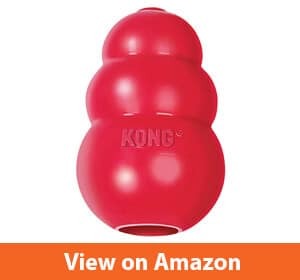 One of the best features of Kong toy offers is that the dog owner can fill it with dog food and peanut butter so your puppy can have a delicious treat during its playtime. If your pup is coping with teething, then Kong Classic’s soft rubber will help elevate the discomfort. Available in four sizes from small to ginormous, this cute and exciting toy is the favorite of puppy owners worldwide. The toy is basically a log of a plush tree trunk with removable squirrels in it. In every squirrel is a large squeak which adds all the more fun to the playtime. It doesn’t only keep a busy entertained for a long time period but it is also an excellent option for a fetching game. This toy is especially good for pups because they can easily bite it, squish it or throw it without hurting their growing teeth or gums. The hide and seek squirrels will not only provide your pup with a physical stimulation but will exhaust your dog physically as well as it will keep your pet on toes for hours. The only drawback is that is your puppy is growing teeth, then it may destroy the toy’s stuffing with its teeth. However, the fun and the squeaky excitement it gives is definitely worth it. You can also hide the squeaky squirrels so your pup can sniff and find them. For pets who love to rip out the stuffing of their toys, this toy package from ZippyPaws is a perfect choice. 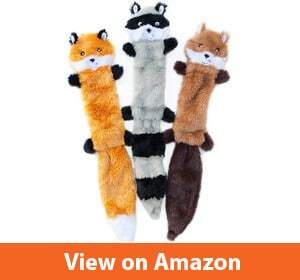 It comes in a pack of three animals including fox, raccoon, and squirrel and each one contains multiple squeakers to keep your pup entertained throughout. The toy measures 18 inches long which means that it is suitable for puppies of all sizes. As it does not come with stuffing, the owners don’t have to worry about cleaning the mess when their pups rip off the animals. The toy is unique and because it doesn’t have stuffing, it is durable as well. As it comes in a pack of three, you can gift them to your pup as individual gifts too. The enticing sounds of the squeaks keep your pup away from getting bored and your pup will be able to have a squeaky fun time. If an owner has two pups, then this toy can also be used to play tug-of-war among puppies. Built by keeping safety in mind, these toys are made of premium quality materials. If an owner has a pup whose bred is naturally aggressive and tough, then this toy is for them. Manufactured in the USA, it is guaranteed against even the most ferocious dog damage. Not only that, but this fun toy can also be filled with delicious dog treats for their motivation. It can securely hold the dog treats inside and getting to those treats can be fun, exciting and challenging for the puppy. The toy comes in a small and large size and there are three color options for the owners to choose from. The exciting color options are Tangerine, Granny Smith, and Aqua Blue. Another feature of this toy is that it has the capacity to hold dog treats of any size. Even the puppy owners love to put exciting and different treats to the joy of the puppies. As it is challenging to get hold of the treats inside the bone, it stimulates your puppy for a long time. You can also wash it in your dishwasher after a few days of use. For pups who love to play in their mealtimes, Bob-A-Lot is a superb toy. It’s a unique design and interactive design keeps the dog entertained for a long time. By holding a variety of features, it makes to the list of the best puppy toys in the world. 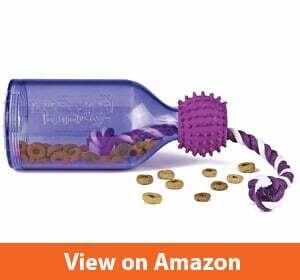 You can fill this wobbling toy with dog treats and kibble and then you can make it easy or challenging for the puppy to access the treats. The openings on both sides allow the treats to fall out and you can make challenging to give your puppy the exercise it needs. The puppy will have to chase for food and it will make the mealtimes and fun and exciting for the puppy. The toy comes with an anti-slipping bottom which means that your puppy can play with it without falling over. The toy offers intense mental stimulation that your puppy needs along with the physical exercise. Fill the toy with treats and enjoy watching your puppy push it all over the floor allowing the treats to fall out. Specially manufactured for puppies and smaller dogs, this toy is not an average treat holder. Instead, it is a fun and exciting game for your puppy that will keep it entertained for hours. 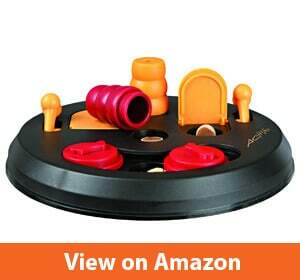 Filled with hurdles and puzzles to access the treats, this toy will challenge your puppy physically and mentally. With its pop-up and side-to-side flap features, your puppy will be stimulated mentally in order to get the kibble. Unlike the standard dog toys and treat dispensers, your puppy will have to work hard on this toy. Some cones need to be pushed will others need to be popped up. As the dogs expound their energy on this toy, they don’t get bored. Another good thing about the Trixie Flipboard is that you can increase or decrease the placements of and places of treat making the game hard or easy. You can enjoy watching your puppy flip opening and pushing the compartments to get to its favorite treats. If your puppy is a newborn then you can start from easier levels and gradually increasing the compartments and levels. This toy provides your puppy with the mental stimulation it needs in order to win a treat. 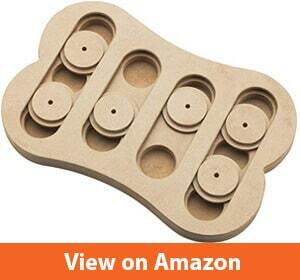 The toy is a board in the shape of a wide bone and has ten holes where you can securely hide the treats. Among these ten holes, six of them are slidable which provides your puppy with a challenge to find its kibble. Being a puzzle game, it tests and challenges the mental skills of your pet. For many pups, it takes some training while others are smart enough to figure out the sliders on their own. As it is time-consuming for the pups to get to all the treats, owners can even leave them alone with the toy without worrying to bore them. The manufacturer has designed the toy in such a way that it improves the IQ of your pet. With the help of this game, they get mental training and playtime all at once. Made with wooden material, this playboard is durable and reliable. As it is made of wood, it is safe for your pup’s growing teeth as well. 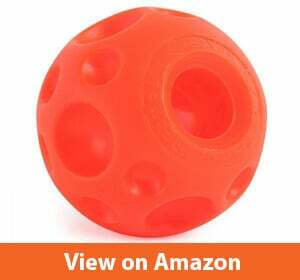 Even though Omega Paw Tricky Treat Ball looks simple and boring but it is known to be the best dog stimulators globally. 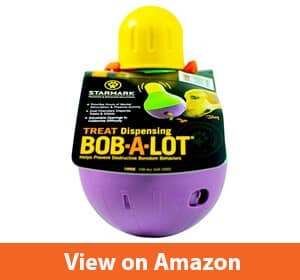 Perfect in size, this toy is a great dispenser for dog treats. The unique feature of this toy is that there isn’t only one opening for the treats to fall out from but there are various nooks and crevasses that you can fill. As the toy is made up of soft material that is easier to bite and grip, you can also fill the nooks with peanut butter. When your pup bites into it and squashes it, the treats will ooze out. The toy comes in three different sizes and the small size is particularly for pups. As there are a lot of nooks in the ball, your pup will be kept entertained for a long time. You can fill it with treats of all textures, shapes, and sizes. If your pup eats very quickly, then this dispenser can slow it down and give your pup a challenge for its meal. Similar to the Kong Classic, this toy offers the same purpose. It comes in three sizes from small to large and it comes in black color. A perfect stimulator for puppies, it is the most widely known dog toy in the world. The best thing about this toy is that it lasts for many years no matter how ferocious your puppy is. You can stuff this black tackler with dog treats, cheese whiz or peanut butter and your pup can have hours of fun accessing the delicious treats. Although it gets messy with the treats, owners just put it in dishwashers and the toy comes out as good as new. The toy is excellent for mental stimulation as well as physical exercise. As it is made up of a rubbery material, it bounces off on the floor in unpredictable directions making your puppy to catch and chase it all the way. Being ultra-durable and rubbery, its erratic bounces fulfills the dog’s need to play. As you know that puppies love to tug and things, this toy keeps them busy and entertained not only mealtimes but throughout the day. 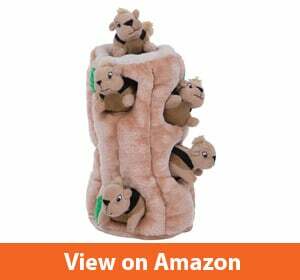 If your puppy is of a stronger and heavier breed, then this toy is especially perfect for them. As your pup keeps on tugging at it, its treat dispenser regulates on its own. This dog is especially good for training puppies because it induces a multisensory function allowing your puppy to see, hear and smell the treats all at once. In order to ensure maximum safety, the toy is made up of 100% non-toxic materials. Another good feature of this toy is that it is durable and safe to put in a dishwasher. The texture of the toy is rubbery which allows the gums and growing teeth of the puppy to be stronger and healthier. If your puppy is a fast eater, then this tugging toy helps to slow down its eating pace as well. The toy is perfect for your dog’s mealtime and entertainment. How to Choose The Perfect Toy for Your Puppy? Also, make sure that the toys you get for your puppies challenge them both physically and mentally. It would enhance their multisensory functions and will make them cleverer. Even though there are a lot of puppy toys in the market but you should get a few toys where you can participate with them in the game. It will allow you to create a stronger bond with your pet and it will get fond of you pretty soon. For example, the fetching toys are perfect if you have just gotten a puppy and you want it to be familiar to you. Every dog toy serves a different purpose so it is important that you get your puppy a toy of every sort. There must be toys that keep your puppy engaged when you are home and there should be toys that are helpful during the mealtimes. You should also get them toys that challenge them mentally and physically. All of the above-mentioned toys are the best puppy toys to keep them busy. If you can manage to buy all of these toys for your puppy, then you should definitely do so.